Light emitting displays, including CRT, LED, OLED, LCD, Plasma and other technologies, all suffer from a visibility problem when used under conditions which include high ambient lighting levels. Examples of these conditions abound; they are found in all applications in which the display is exposed to uncontrollable outdoor lighting. This is encountered in kiosks, advertising displays, control towers and aircraft cockpits, to name just a few. In order to improve the situation, several technological developments have been made. The luminance of the display must be increased well above normal levels expected for indoor use. The contrast must be made as high as possible and precautions must be taken to avoid direct specular reflections from the display surface. Increasing the luminance of a liquid crystal display by increasing the intensity of the backlight brings numerous disadvantages. The power consumption becomes very high, thermal issues arise and cost soars. Recent improvements in the efficiency of light collection have offset much, but not all of these problems. These improvements include the use of optical films in the backlight to allow more of the emitted light to be directed out of the front of the display. Once a minimal level required to overcome light adaptation effects has been reached, it becomes necessary to increase the contrast ratio of the display in order to make the display legible. Contrast ratio of a display in high ambient lighting levels requires that the reflections, both specular and diffuse, from the display be carefully controlled. These can be minimized by the use of antireflection coatings on the front surface of the display. For flat panel displays, this cannot easily be directly applied to the display because the depositions must be done under conditions which will severely degrade the display materials. 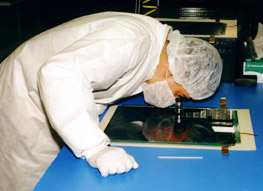 Consequently, a secondary optical element must be considered, which can be either a glass or plastic overlay that has the antireflection coating applied to it. However, if this overlay is merely physically mounted in front of the display, there are still major reflection problems. The inherent display reflection is unaffected and reflections from the rear surface of the overlay will worsen the situation. Enter Optical Bonding. Optical Bonding is a shorthand phrase for use of an adhesive with carefully selected optical properties to adhere two or more optical components to one another. The adhesive may be selected from a number of different polymer types and the optical elements may be parts of a lens, a display system or other optical assembly. The purpose of the bonding is to improve the optical performance of the system in some significant way. The adhesive to be used must meet a number of sometimes conflicting requirements; mechanical, chemical and optical. The material must have adequate cohesion to prevent being torn apart during handling of the product. It must adhere to the optical elements to ensure they will remain in the desired alignment to one another. It must be capable of withstanding the environment; specifically, temperature and humidity. It must not degrade when exposed to high light levels, which may include substantial amounts of UV or IR radiation. In a few applications, other environmental requirements must be met. Chemical properties of importance include the need to be inert toward the optical elements, as well as chemical liquids and vapors that may be encountered in the application of the product. The optical elements are usually glass, but may include polymeric films and plastic overlays. The adhesive must not adversely affect these either chemically or optically. Furthermore, the conditions for curing the adhesive must not degrade any of the primary optical components. Because we are using the adhesive to improve the optical performance of the product, it obviously must have the proper optical properties to do so. The refractive index must be a close match to the other elements of the product. The adhesive must be clear, or, if colored or neutrally absorbing, must be of the desired color, with good control of both the transmission spectrum and peak transmissivity. The materials which may be considered include the range of polymeric bonding plastics; polyurethane, epoxy and silicone are the primary candidates which we usually consider. The adhesive may be a gel, as are most of the silicones, or it may be more or less rigid, as are the polyurethane and epoxy compounds. The choice depends on the ultimate product application conditions. For the great majority of our products, we use a silicone to provide the optimum blend of properties. The selection is made only after a consideration of all of the relevant specifications, including environmental, optical and mechanical. The overlay to be bonded to the display must also meet many different criteria. It must be mechanically robust, have the desired optical enhancing properties and be cost effective. For most applications, the material of choice is glass, which may have a surface treatment to break up the specular light image (antiglare etch) and it may be coated with antireflection layers and perhaps conductive layers, as well. Details of the selection criteria which General Digital Optical Bonding Laboratories applies are the subject of another discussion. Every LCD, OLED and Plasma display design has a distinct personality when it comes to the bonding process. Because of the wide diversity of designs used by various manufacturers, it is critical that General Digital Optical Bonding Laboratories examine your proposed display selection to determine how “friendly” it is to the bonding process. During optical bonding, we will generally remove the display from the frame in which it arrives, remove the backlight assembly, disconnect the cables connecting the driver boards and lay these boards out flat with the display surface. Masking materials are applied to the interconnect areas between the display and the driver boards to prevent contamination by the adhesive. After successful completion of the bonding process, the boards are returned to the original configuration and the display is remounted into the frame. Some designs of backlight and driver boards are not fully compatible with this handling, which may necessitate us to use other approaches. For this reason, General Digital Optical Bonding Laboratories will conduct a thorough engineering review and evaluation of your proposed display and, if the LCD, OLED or Plasma display is not one we are familiar with, or which is known to present unique difficulties, we will make a prototype to assist both you and us in determining the feasibility of the program. Because of the delicate nature of some parts of the flat panel display structure, occasional rejects will be caused by breakage of flex cables or damage to the circuit boards. 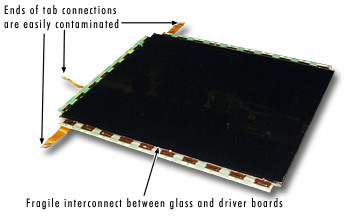 In addition, failure of the masking material may allow the adhesive to penetrate into the bond area between the driver board interconnect and the display. Although these situations are very rare, it is important that you be aware of these risks when planning your program. General Digital Optical Bonding Laboratories conducts all of the critical optical bonding processes under clean room conditions. Each part to be used is treated with great care to exclude any form of debris; room dust, hair, skin particles and the like are rigorously excluded from the bond. Despite the best of care, however, there may be occasional particles or air bubbles trapped inside of the bond layer. For many applications, it is necessary to have the highest level of quality; no defects in the bond allowed. For many others, however, an occasional bubble or particle will not be detrimental to the functioning of the display. For this reason, it is essential that General Digital and you, the customer, agree on defect levels which can be permitted, with due consideration being given to the impact of this level on the cost of the bonding process. Another source of trouble is a direct consequence of the optical phenomena exploited to make an image in the LCD, OLED or Plasma display. During manufacture of the display, the spacing of the two glass pieces is carefully controlled in order to produce the necessary optical properties in the cell. If this spacing is distorted, there may be effects on the performance. This is readily demonstrated by pressing a finger on a liquid crystal screen and observing the color rings that result. The manufacturer of the display attempts to minimize this by inserting spacer beads uniformly over the surface of the display. However, sometimes on early prototypes a similar phenomenon will be observed in localized parts of the display as a result of using temporary fixturing which may allow stresses to be frozen in place during the adhesive curing cycle. At other times, seemingly inconsequential changes to the procedures in making the bond may also give rise to a spate of problems with birefringence. Although born of necessity for our own products, General Digital Optical Bonding Laboratories is pleased to be able to offer you the benefit of our expertise in improving your displays. We welcome the opportunity to serve you. For further information on how to access our talents, please contact one of our qualified Sales Engineers.